Showing results for tags 'klf'. KLF glue problem, when was production fixed? KLF line glue problem, when was production fixed? 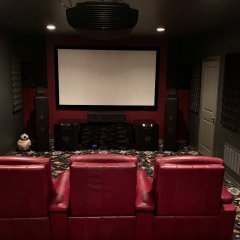 Located Southeast of Phx, AZ Klipsch KLF-30 pair, plus Klipsch C-7 Center channel combine to make an incredibly powerful High Fidelity Home Theater or Home Stereo setup. These speakers sound Amazing! This set is used, in Moderate condition. There are some cat scratches on the left side of one KLF-30 cabinet, and some minor surface scratching on top of other KLF-30 cabinet. Center is in Great condition. Also included is a brand new set of Factory Klipch KLF-30 grills, never installed, never removed from factory bubble wrap. I hate to sell these, but I must due to downsizing and moving for work. Listed for $1,300 OBO, very motivated seller. Make a reasonable offer Buyer is responsible for shipping Cost and Arrangements. I also have a pair of Heresy I, Parasound HCA-2205a, Parasound PHP-850, Yamaha RX-v995, and Monster Cable HTS-5000, MIT Terminator 2, and Synergistic Research AC Coupler available if interested. How to ship KLF-30 pair + C-7? Hi all! This is my first post to Klipsch Forum, so Hello everybody! I will be selling a pair of KLF-30s with C-7 and I'm looking for input into shipping options, cost, and insurance... Would you guys palletize and send Freight? Try something like uShip where the shippers bid the load? Or FedEx/Ups? I do not have the original boxes (omg, I wish I did). How would you pack them to insure no damage? I appreciate any input. These are great speakers and I just want to be sure any potential buyers can enjoy them without headaches. Came across a set of 30's for the right price so I decided to attempt a ground up re- design in an attempt to finally squeeze from this speaker the bass it SHOULD be producing. Although I currently own a pair of KLF 20's and a pair of KLF 30's, I couldn't pass these up at the price point I STOLE them at. Planning to reinforce the cabinet to the tune of 1.5" mdf ( box-in-box) with all the proper dampening, insulation, bracing, etc. Cabinet re-tune, correct those useless ports, and in all likelihood will try a non-crites crossover custom built by Norman Cerveny Pro Audio. Will refinish the outer cabinet as well with unfinished wood veneer with many coats of Hi Gloss lacquer, haven't decided on a stain color yet. Although KLF 30 mods are fairly standard these days, Norm Cerveny will be doing these from start to finish since this will be more than a simple modification. Klipsch klf 10 schematic net.pdf Although I have refurbished a few of the KLF-10 crossovers, I am looking for a better understanding of what does what. The 10 is speced with a 2300hz crossover point. I am trying to figure out what formulas have been used to arrive at that. I have googled every which way I know to find a simple formula on a second order low-pass circuit with the load being 8 ohms and all the charts I have found show the components to have greatly different values than the schematic. My assumption is that this is a second order butterworth circuit? Also, what does the resistor do in the hi-pass circuit, just knock down the signal or is there more to it? Thanks for the education!